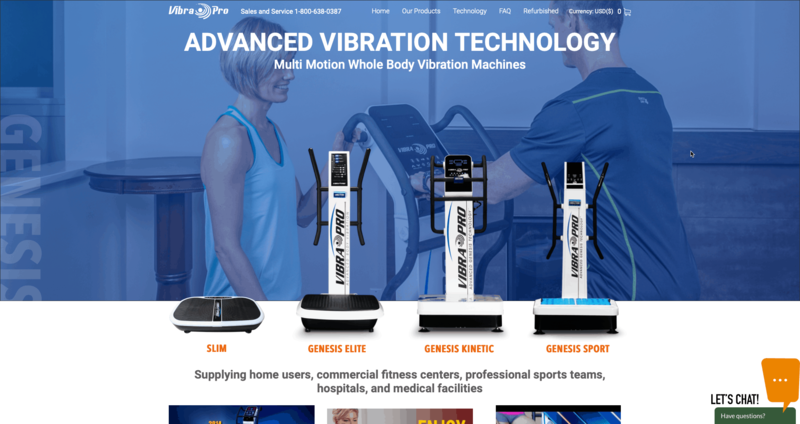 VibraProFitness is the go-to brand for advanced vibration technology with its high-quality multi-motion whole body vibration machines. 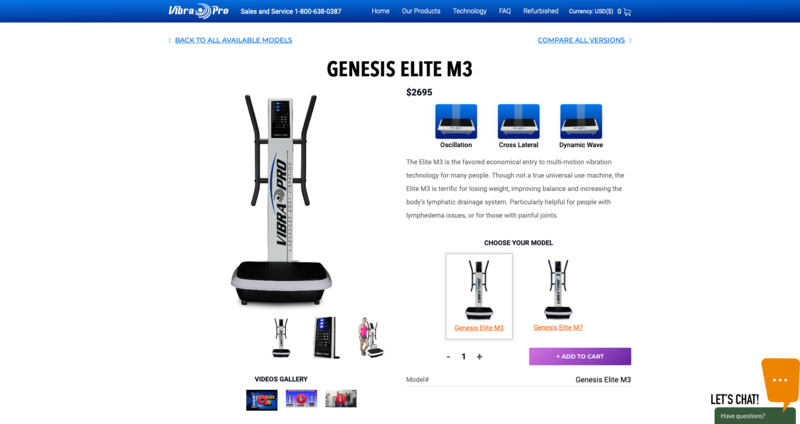 The brand has been supplying these machines to home users, commercial fitness centers, professional sports teams, hospitals, and medical facilities for many years now. Through detailed study and analysis of how the body responds to different types of vibrations, they have engineered whole body vibration machines to give users the best possible results utilizing multiple different vibration movement styles. There is no single motion vibration machine available, that can be as effective as their multi-motion body vibration machines. 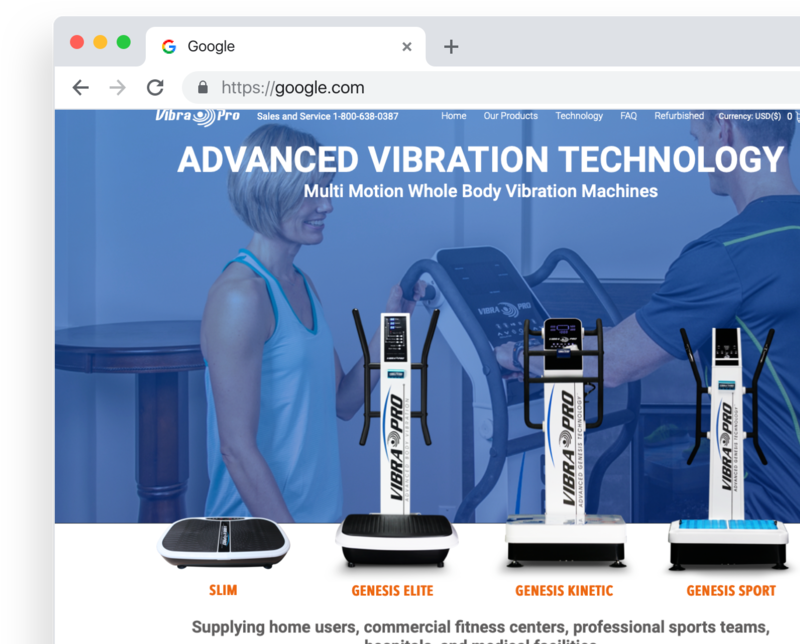 For over a decade now, VibraProFitness takes pride in all their successful machines beginning with the patented Premium Oscillation motion, followed with the release of the patented Spiral Rotational motion, and now the newest Dynamic Wave motion. 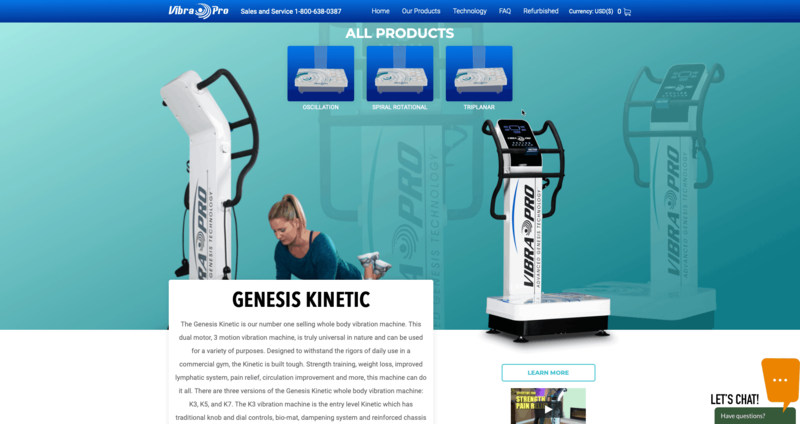 VibraProFitness is definitely the leader in the whole body vibration therapy industry. Furthermore, their patented Vibration Dampening Technology has made vibration machines safe for people of all ages. No more risk of harming soft tissue or weak joints. VibraProFitness specialized trainer cards give users a complete and effective workout by automatically adjusting motor speeds, movement type, and movement patterns to better suit individual user needs, resulting in the most effective 10-minute workout possible. 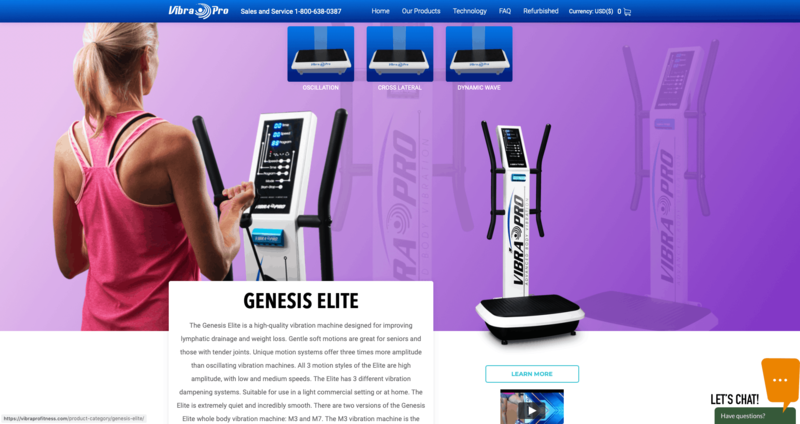 For this project, VibraProFitness wanted to have a website that can represent the brand in the most effective and efficient way possible. Our team came up with a beautifully-created website that fits the no-fuss persona of VibraProFitness. First and foremost, the website dons a fully customized responsive WordPress design with the help of wireframes. One of the highlights of the website is the custom buyer's guide page. It contains all the necessary information one needs to learn about each of their products. Potential customers can check out product videos, prices, model comparison chart, and percentage of benefits and effectiveness. We also added a custom news page wherein users can find the latest company news and vibration-technology related news. Our team also listed all the frequently-asked questions in the FAQs page. However, if you still can’t find the answer you are looking for, you can shoot your question or simply message the Vibra Pro team on the contact plug-in. The form is located on the bottom portion of the FAQs page. Our goal is to make this website full of information as possible. 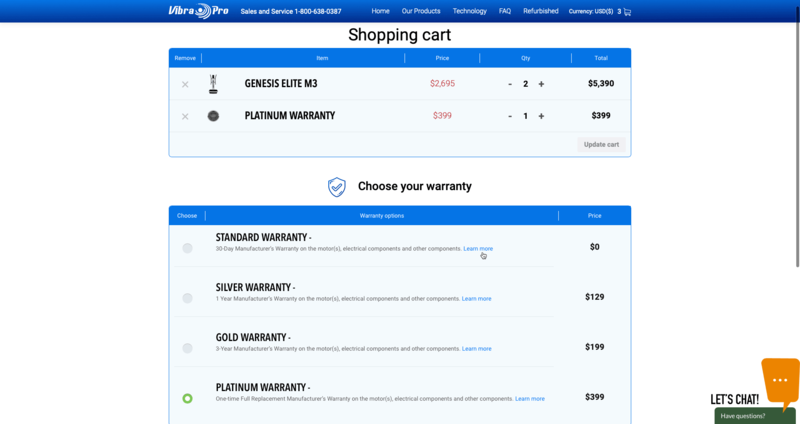 We have also added custom pages for the following: shipping and warranty, accessories, dealers and refurbished products. We know these are relevant when buying machines and should be included in the website. Lastly, all these features are very important and make up the entire website which loads and looks excellent on mobile devices, tablets, and desktop computers. It was a custom design and development solution for Wordpress CMS. We integrate fully custom shopping cart page with payment gateways. Company Website for OhmTech Fire Protection Let`s Make Something Awesome!